I wrote this story in an attempt to poke gentle fun at the 'tropes' of SF, fantasy, and horror. And in the story title, I tried to include elements of all three of these sub-genres of speculative fiction. The story also tries to extrapolate on the future evolution of the English language. Many of my stories concern the nature of language. Weredragons appeared first in Baen's Universe, June 2007. 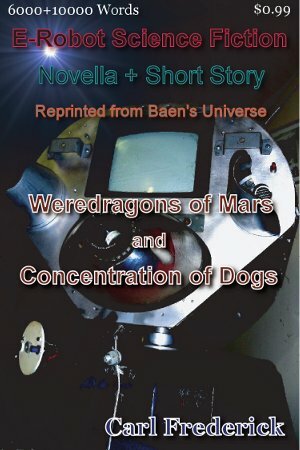 This story of dogs working in concert, appeared in the on-line magazine, Baen's Universe, in 2007. I'm not sure that the tale isn't as much horror as SF. The indefinite ending of the tale suggested to me that it should be longer—so I wrote a novel of the same name which takes the story to a conclusion.